Keeping up to date with the latest developments is vital for PE teachers. Activ8 can help your school by providing training sessions, workshops and CPD for new and existing staff members. Our training can take the form of twilight, staff meeting or inset sessions as required, and is always tailor made to meet your school’s needs. A great way for Activ8 to work with your school is through lesson demonstration and support. We can demonstrate lessons to help you utilise the schemes and resources your school has in place, or that Activ8 have created for you. We can also support your teachers by working alongside them during lessons, or offer PPA cover as required. 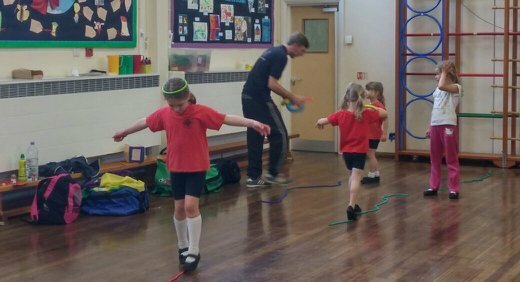 Activ8’s multi skills approach helps ensure pupils develop the core skills of co-ordination, movement, thinking and body awareness. These skills underpin the development of all sport, and we can help you bring a multi skills approach into your school. Thank you so much for a fantastic party today. Vincent had the best time ever and a lot of his friends are saying how great a time they had. Brilliant! Loads of activities to keep my nearly 4 year olds and 6 year old entertained. During the holiday club you can drop off at 8.30 and collect at 4.00……and then get on with a days’ work! Thank you so much for Connies 3rd birthday party today. Everyone commented that you were both amazing and the kids had a ball! THANK YOU! Our boy loves going to football on a Saturday and has come on leaps and bounds! A really friendly team and fun too! I can’t recommend Activ8 highly enough, both the classes & parties. Debbie has just run my son’s party for the 2nd year (at my son’s request) & did a fantastic job. She kept 40+ children entertained for the entire party. My son went for the first time to the club at Hawthorns in Durrington in the may half term with my nephew & loved it. He didn’t want to leave & both boys said it was the best holiday club they’ve been too looking forward to the summer. Brilliant – my 4 and 7 year old loved all the activities throughout the day and made new friends. Very well organised and all activ8 staff are friendly and do a great job. Highly recommend. Activ8 is fully insured with £10,000,000 public liability insurance. Health For Living – What’s It All About?